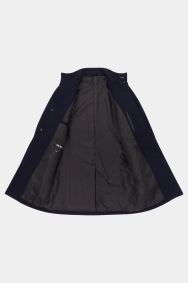 Stylish outerwear to compliment your formal look. 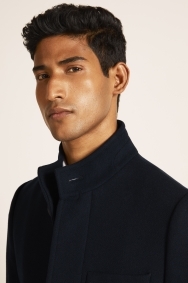 Made from warm, wool-rich fabric with a diagonal twill weave, this navy coat from DKNY features 3-button fastening and a funnel neck design that will keep out the cold. 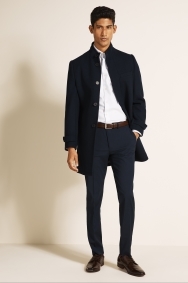 Slim fit tailoring makes for clean lines and a modern profile, while slanted exterior pockets lend it a more casual edge. 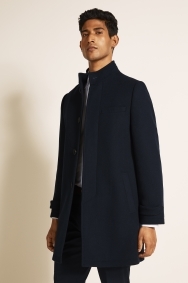 This coat will easily slip over your suit if you need an extra smart layer. Alternatively, pair it with an open-necked shirt if you’re keeping things relaxed. 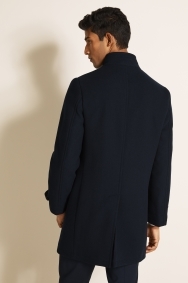 It’s a very nice warm winter coat that I could easily wear on a posh night out or just a walk in the park. Great product. Fits well !! !